The Kanger FIVE6 is the biggest, most unique mod that we’ve ever reviewed. Surprisingly, the whopping five 18650 batteries that it holds isn’t even the craziest feature. That title belongs to the tank and it’s adjustable coil engagement. Let’s dive right in. I’m going to go ahead and say that the manufacturing quality of the FIVE6 is outstanding just for its innovativeness alone. Kanger really came out of left field with this, and I like the result a lot. This surprises even me, because I wasn’t really digging the other mods out there that have more than two batteries. It felt like overkill, and I didn’t like the way they looked all that much. So why is this different? Why is five batteries better than three or four? For starters, it’s really not that heavy. There is a lot of plastic involved with this, but it doesn’t feel cheap and this helps keep the weight manageable. Surprisingly, this is actually lighter than many mods that I’ve tried. I was expecting it to feel like a brick. Don’t get me wrong, it’s still heavy. But it’s manageable. I also really like that this also serves the purpose of a charging bank. This has an actual USB port for you to plug in your phone or camera. I like this feature a lot because it adds to the versatility. They’re very clear that you cannot charge this through that port, but you shouldn’t be doing that on other vapes even if it’s technically an option. The rest of the actual mod is pretty standard, but the tank is anything but that. To begin to understand it, I think you have to start with the coils themselves. Inside the coil head there are three pairs of coils in parallel, meaning that there are six coils altogether. The crazy thing is that the coils don’t have to run together. Each pair has it’s own separate connection when you screw the head into the tank, and the tank as switches on the outside to activate or deactivate individual pairs. This means that with one tank, you can vape on two, four, or six coils and alternate between different configurations with the flip of a switch. No one else has anything close to this type of functionality available, at least not to my knowledge. One more thing. They include a color changing glass that you can use for your tank instead of the regular clear Pyrex. Relatively small compared to everything else, but still cool. The flavor quality is excellent. I really enjoy this tank. I tried it with every combination of coils, and I’m going to share my notes on each here. For starters, just using 2 coils works wonderfully. I thought it may feel underpowered or just not work great, but I was wrong. I got an incredibly smooth vape with amazing flavor, and the cloud size was massive. You can take a pretty long draw with just two though. When you bump it up to four total by activating two pairs, you can tell it gets warmer immediately. 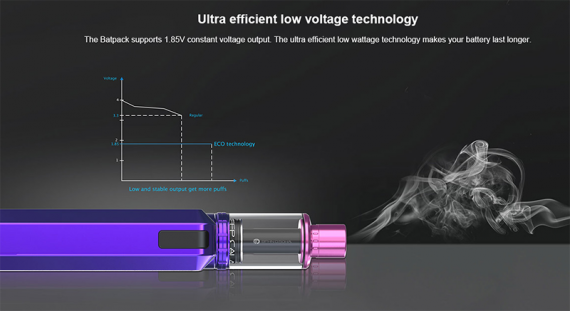 The vape automatically increases the wattage when you activate an extra coil pair, but you can always decrease this manually and the vapor gets cooler again. Even though it was warmer, it was still smooth with good flavor, and the clouds got even bigger. Adding the last pair bumps the wattage up even further. This was a bit too much for me, and even a short draw delivered absolutely massive clouds. The flavor was still good. 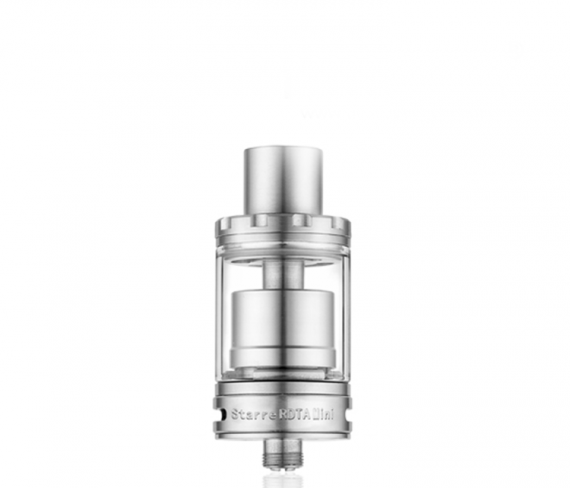 If you like vaping at high wattage, you’ll enjoy this tank I think. The power flexibility is good. The max wattage is 222W, which may be surprising to people who assumed that 5 batteries meant insane power. In this case, the extra batteries are there for delivering insane battery life. I like this decision, because I’ve never felt the need to vape anywhere near the 222W max of this. While it doesn’t have advanced heating modes like temperature control, it gets extra points since the battery bank can be used for charging. You’d think all these features would make the FIVE6 hard to use, but it’s actually pretty simple. Like I mentioned above, there aren’t any heating modes outside of just changing the wattage.So all you really have to do is turn this on and choose how many watts you want to run. When you want to activate or deactivate a coil pair, you just flip a switch. When you want to fill your tank, you slide the top open and fill it up. The batteries are accessed by sliding the entire exterior case off. This is one of the biggest mods on the market, so it obviously is far from being considered portable. 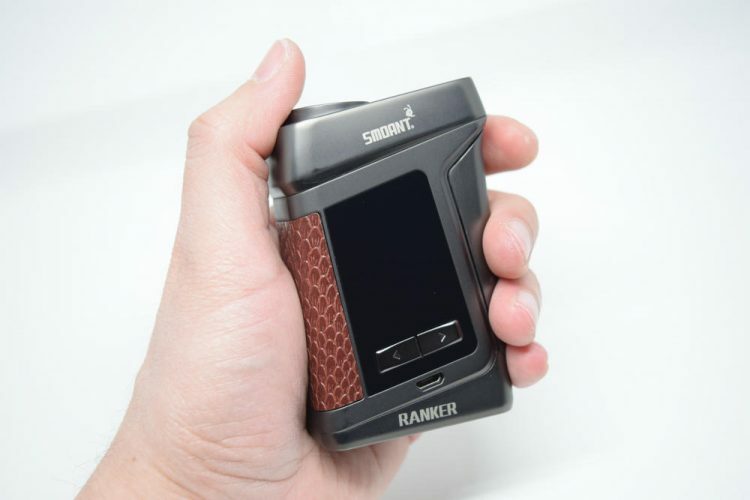 But before you completely discount this, you should also know that it’s comfortable in the hand.There’s also the fact that it will give you the best battery life out of any mod on the market. So if you have a place to carry this other than on your actual body – like a backpack or a purse – this could actually be more portable than anything else in the sense that you won’t have to stop and charge it for long periods of time. I’m a big fan of what Kanger did with the FIVE6. The size may mean that it isn’t practical for many people, but there’s no denying that it’s extremely innovative and delivers excellent performance. I’m not sure that I would recommend this to anyone looking for their first vape, or anyone who wants one vape to use in all circumstances. With that being said, I would recommend this to pretty much anyone who has a collection. You know who you are. Good day, dear vapers and just connoisseurs of delicious e-steam. 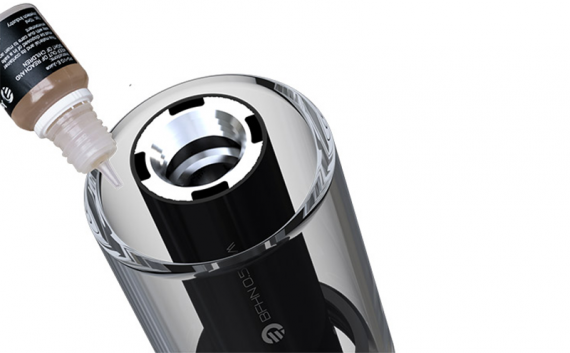 April 23rd , Joyetechfirst published on social networks its new product. It turned out to be a starter kit that can run on AA batteries and Ni-MH format factor batteries. I do not know whether it is broken or not, but imagine that you can now float on conventional batteries (approximately 150 puffs on two AA batteries and approximately 800 puffs on two Ni-MH batteries with a capacity of 2000 mAh). Problem with batteries gone? The charge ran out, went to any stall, or a specialty store bought two cheap batteries and continue to soar. Well, I do not know what it will be, time will tell and we will know about it in just a couple of months. In the meantime, let’s get acquainted with the novelty and see what the Batpack starter set is. 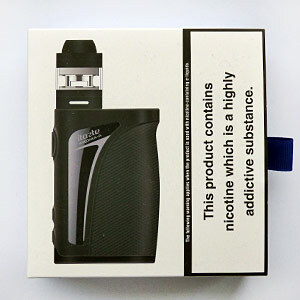 The mod is packaged in a package familiar to the Joytek members – a black box with a logo and a paper “wrapper” with basic characteristics, warnings and other information that, in one way or another, relate to the device inside the box. On the “Overwrap” the mod of the same color as inside is depicted. 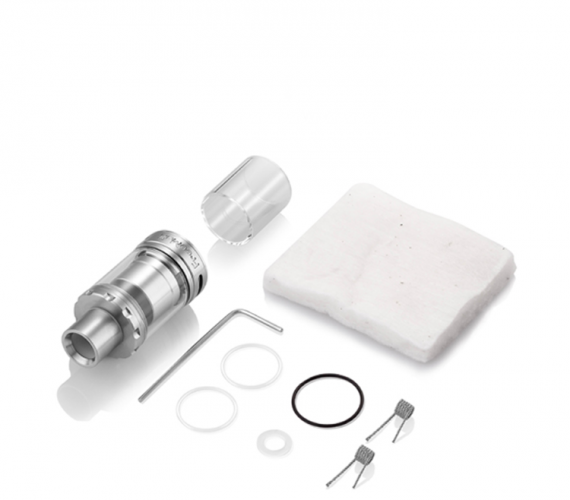 The package includes: mod, manual, evaporator BFHN, special compact atomizer ECO D16 . It is not difficult to guess that the D16 somehow hints at us on the diameter of the atomizer (16.5 mm), although you can’t probably call it an atomizer, but oh well. If we consider the appearance, then first of all it is worth noting the small dimensions of the device, lovers of “stealth”, this is, perhaps, the Joitek team tried for you. Immediately, we note that the mod has no monitor, only a start button with an indicator that tells us about the battery charge. The dimensions of the device are 112.5 by 37.00 by 18 mm, the dry weight is about 90 grams. On the case of the fashion itself, you can look at geometric patterns that emphasize at least some design idea. The color palette is presented immediately in six different colors, among which are monotone (rainbow, bright green, golden) and combined colors (red and yellow, black and blue, blue and pink). So, and the most interesting, probably, in this mode is the format factor of the batteries, I will not be particularly stinging, I have already said everything in the first paragraph, I should probably say that the mode has a low output voltage, only 1 , 8 volts. Oh yes, BFHN removable evaporators with a resistance of 0.5 ohms, this can be seen from the output voltage with these numbers. Another manufacturer strongly recommends not to use the atomizer with other box mods. Here is such a starting set we were given once again by the developers of the company Joyetech. It costs not so expensive, 35-40 dollars , so far it is a novelty, for shares it can be found for $ 20. 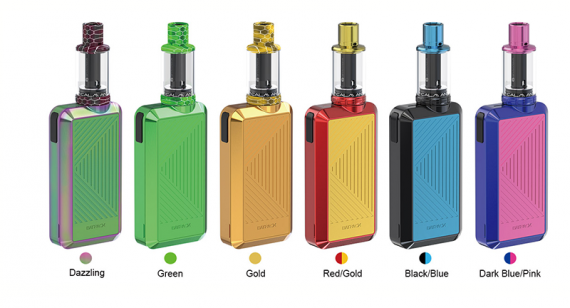 The Eleaf Lexicon comes in the classic packaging – a cardboard box with the assembled Lexicon mod and Ello Duro tank on the front, and a list of kit contents and company information on the back of the box. Fairly common packaging, so there’s no point going into details about it. Inside the box, we have the Lexicon mod placed inside a plastic holder, next to the Ello Duro tank, a spare glass tube for the tank, and an extra coil head (there is one pre-installed in the tank). Underneath the plastic holder we have a smaller cardboard box, where we’ll find the micro-USB charging cable, a small bag of spare o-rings and gaskets for the tank, as well as user manuals for both the mod and the tank, and several other informative cards. All in all, it’a nice kit which provides everything you need to start vaping – minus the e-liquid – as well as a few nice extras, like the bonus tank glass. This is where the Eleaf Lexicon really shines. Don’t get me wrong, it’s also a very powerful dual-battery mod and is packed full of neat features, but there are plenty of those around these days. As soon as you pop in a couple of 18650 batteries, you can tell that it’s main draw is a visual one. The Lexicon is primarily made of zinc alloy and measures 81mm x 31mm x 45 mm, which puts it in the mid-size category of dual-battery mods. It’s actually a bit shorter than most of my other mid-size mods, but a fair bit chunkier as well, so if you have really small hands, it may feel a bit too bulky. I received the purple version for this review, but the Lexicon comes in a variety of vibrant colors, and it also matches the color of the tank as well. 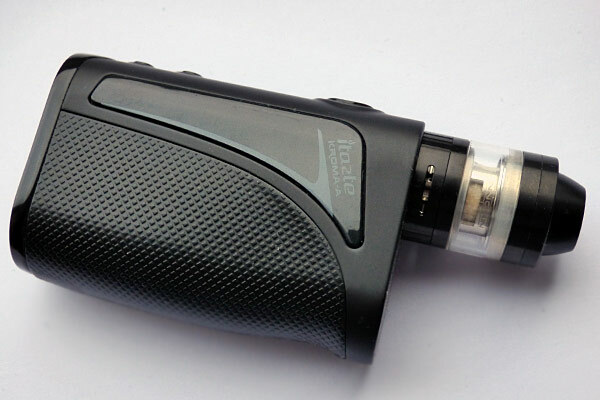 In terms of design, the Eleaf Lexicon can be described as a box mod with rounded edges and corners. Two of its upper corners are actually replaced with triangular infinity mirrors, which kind of mess up the whole rectangular box mod look. But its most striking feature is the abundance of LED strips which start to light up the moment you insert the batteries. 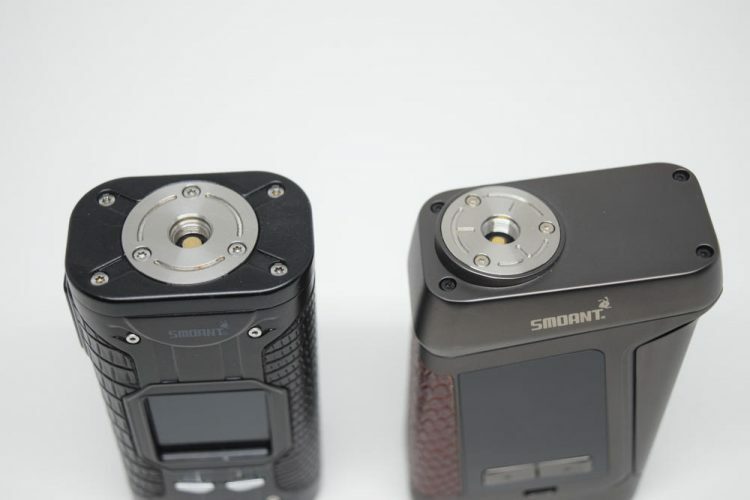 They are everywhere, on the edges of the mod, on both its sides, even on the power button, so if you’re looking to draw some attention to yourself, the Lexicon is perfect. We’ve seen LEDs used on mods before, from the old SMOK Xcube 2 to the newer Sigelei Kaos Spectrum, but never as many as on the new Lexicon. If you like flashy mods with extra bells and whistles, this one’s for you. But it’s not as kitschy as you might expect. If anything, the pulsating lights and those triangular infinity mirrors make the mod look more like a mysterious artefact of immense power than a simple vaping device. So if you’re into that kind of sci-fi stuff, you’re probably going to like it. The Eleaf Lexicon 235W mod features a centered 510 connection, which is always a big plus in my book, as it minimizes the risk of atomizers overhanging. The gold-plated pin is spring-loaded and has quite a bit of travel, so you don’t have to worry about the tank not sitting perfectly flush. What I don’t like so much about the Lexicon is that it only fits atomizers up to 26mm in diameter, without any overhang. For some reason, Eleaf decided to make the top side of the mod considerably narrower than the device itself, which means that any tank or RDA over 26mm will overhang. Now, 26mm is quite enough in most cases, but if you’re going to make a bulky, 31mm-wide mod anyway, why limit options like this? The battery door is hinged and very easy to operate. Just slide it outwards and then lift it up, to pop in the batteries, and press down on the cap and slide it inwards to close. There is no rattling whatsoever, the door doesn’t wobble at all, and there’s virtually no risk of it popping open by accident. It also features some battery venting holes, for peace of mind. The fire button is located on the side of the Lexicon mod, which means you can press it with either your thumb, or your index finger, like you would a trigger. It’s a fairly large, diamond-shaped button, with triangular cut-outs that light up with the rest of the LED strips. It’s made of plastic, but it actually feels quite solid to the touch and it doesn’t rattle at all. 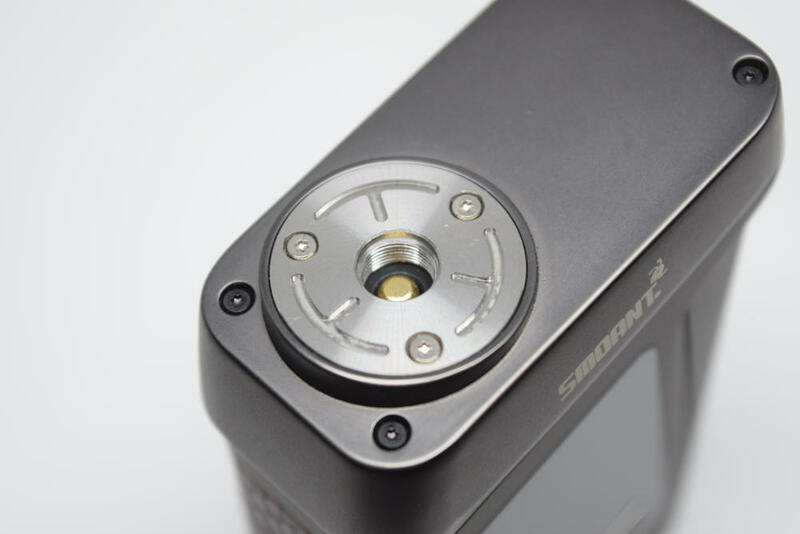 The ‘+’ and ‘-‘ buttons are located on one of the sides of the mod, near the bottom, along with the micro-USB port for charging and upgrading. The buttons match the triangular theme of the device, but they are just a bit too close to each other. I personally don’t have a problem with that, but then again, I don’t have very large fingers. However, I can certainly imagine the frustration of someone with sausage fingers trying to press one of the buttons and accidentally pressing both. Finally, the display is kind of a disappointment to me. It does its job, displays all the information you need, and it’s definitely bright enough, but it just doesn’t match the overall look of the mod at all. For one thing, it’s so small that it literally fits in one of the corners of the mod, it’s black and white, and it’s one of those old fashioned displays that companies have been around for at least 5 years now. If you’re going to make a flashy, “look at me” type mods, why not go all out and use a more attractive screen as well. The Eleaf Lexicon may not have the most impressive screen, but in terms of features and customization, it can holds its own against the most advanced vaporizers on the market today. To turn the mod on or off, all you have to to do is press the fire button five times in rapid succession. While the mod is on, you can access two different menus. 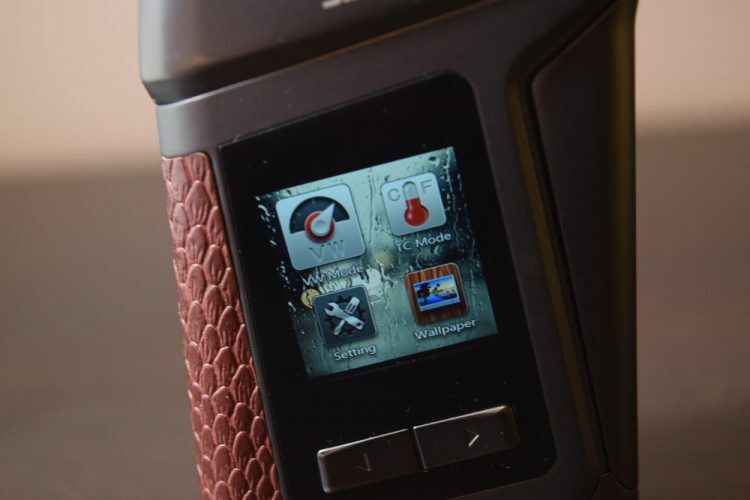 By pressing the fire button three times rapidly, you are presented with a list of available functioning modes – wattage mode, temperature control for three supported materials (nickel, titanium and stainless steel) and three customizable memory modes. Then, there is the secondary menu, which you can access by pressing the fire button and the plus button (right arrow) simultaneously for a couple of seconds. You’ll see a list of icons appear on screen, but because the display is so small, they didn’t even have space to specify wht each icon does. 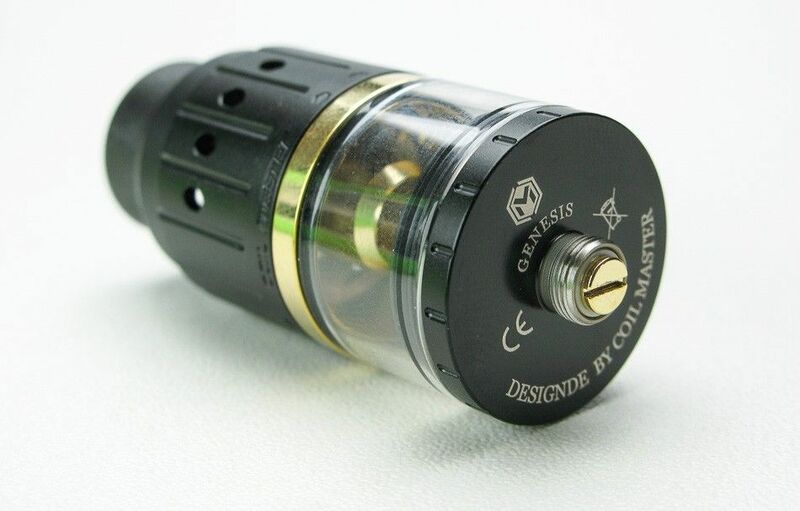 Anyway, the first one lets you lock the resistance of your atomizer (only available in temp. control), the second one lets you choose what subparameters you want displayed on the home screen(amps, puffs, puff duration), the third one allows you to activate or deactivate Stealth Mode (turns off the display and the LEDs when vaping), while the fourth icon lets you set the duration and the intensity of the preheat (this is only available in wattage mode). The ‘LOGO’ icon allows you to display a custom logo on screen every time you turn on the mod, but you must first upload one via PC, using a special software. The clock icon allows you to set the cutoff time of the mod, from three different options – 5 seconds, 10 seconds or 15 seconds. There is also an ‘off; options, but this just sets the cutoff to 10 seconds. Then we have two sub-menus to adjust the duration and flashing patterns of the impressive light show. The first one allows you to select the color that you would like flashing and the pattern you would like the LEDs to flash in. The second sub-menu, lets you choose how long you would like the light to light for – always, 10 minutes or off. If you select the last option, the LEDs will only light up when you press the fire button, whereas with ‘always’ they will stay on permanently. The last two options in this secondary menu allow you to check the firmware and hardware versions currently installed on the mod, and to check the voltage of each of the two batteries currently inside the mod. Unfortunately, the batteries are not marked in any way, so there’s no way to tell which one has what voltage. There are also some button combinations you can use, like keeping the ‘-‘ and ‘+’ buttons pressed simultaneously for two seconds to lock the buttons, or turning on the mod with 10 clicks instead of five in order to see the temperature of the circuit board. These are advanced settings that most people won’t ever use, but if you’re interested in learning more about them, you can consult the included user manual. 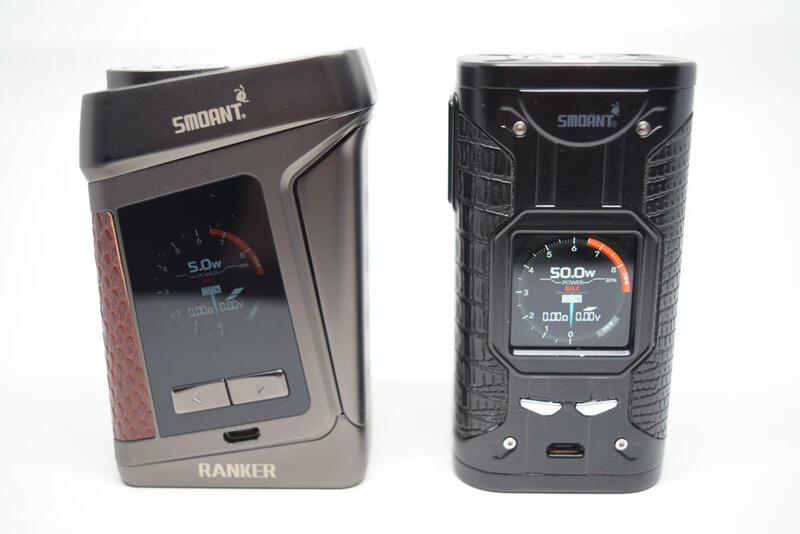 Offering a fair estimate on the battery life of a variable voltage mod that uses external batteries is virtually impossible, due to the many variables that need to be considered. What type of batteries are you using, how much power is the mod putting out, how often are you using the mod? These a re all questions than need to be answered in order to accurately estimate battery life. However, what I can say is that the LED strips do affect battery life. My first experiment with the Eleaf Lexicon was leaving the LEDs always on and seeing if they drained the batteries faster. They did, which wasn’t really a surprise, because there are so many LEDs on this thing that it literally gets hot if you leave them on all the time. I can’t really say if they use up half the battery life, or a quarter of it, but they do have a noticeable impact on it, IF you go for the “always on” option. With the LEDs off, I got about a full day of use out of two Sony VTC5A batteries, vaping at around 60W, which is comparable to what I got out of them with other mods, like the Augvape V200 or the Smok Procolor, for example. I recon that leaving the LEDs on for 10 minutes, will cut a couple of hours, but it’s a fair compromise, if you want to show off your flashy mod. In terms of performance, the Eleaf Lexicon has been performing well, for the most part. One thing I’ve noticed with my particular sample is that the fire button does misfire every once in a while. I don’t know if this is a general issue or just something about the unit I received, but sometimes, I would press the fire button, feel the power ramp up and then the power would cut off for some unknown reason. If I pressed it again, everything would work fine again. It doesn’t happen all the time, but I do notice it at least a couple of times a day. Then there is the power ramp up itself. Good thing that Eleaf included a preheat option, because by default, the Lexicon doesn’t have the fastest power ramp up time. Compared to the VooPoo Drag or the Augvape V200, it feels sluggish, but you can easily fit that by setting the preheat to a higher wattage. Other than that, the Lexicon works quite well. Once the power ramps up to the desired level, the output feels pretty accurate, which is what you’re most interested in when vaping in wattage mode. It also reads the resistance accurately, and I’ve encountered no weird errors of any kind. I didn’t really mess around with temperature control a whole lot, especially since I couldn’t tell if the coils for the Ello Duro tank were of a supported material, but also because I’m not a big fan of temperature control vaping. The Lexicon mod was paired up with the Eleaf Ello Duro tank, one of the several tanks that the Chinese company launched in recent months, and the same one that comes with the new Eleaf iJust 3 (which I hope to review next week). 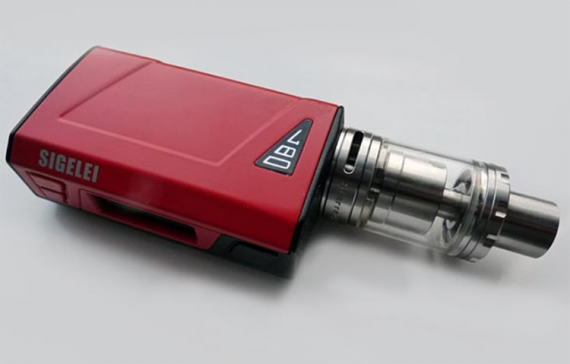 The Eleaf Ello Duro is a 6.5ml capacity tank (with the pre-installed bubble tank) that features a convenient top-filling system and adjustable bottom airflow. The first thing I noticed about the new Ello Duro was that the drip tip and the glass section matched the color of the tank as well as that of the Lexicon mod, for a “matchy-matchy” look. I was a bit disappointed to see that the bubble glass was actually plastic, but the good news is that you have a classic glass section included in the kit, if you want to replace it. Unlike the original Ello tank, or the Ello TS that cam e with the Eleaf Tessera, the Ello Duro comes with two different styles of coil-heads which feature metallic mesh, instead of the conventional wire coils. The pre-instaled one was rated at 0.15Ω and the spare one in the box at 0.20Ω. The texture of the mesh was also visually different, but I can’t say that I noticed a considerable difference in performance. They both vape the same way. I’ve been using the 0.15Ω for a week and a half now, and it’s still going strong. Granted I’m currently vaping a fruit mix that’s very light on sweeteners, but still, I’m very happy with the coil-head so far. The flavor is above average, and the vapor production is amazing, especially at higher wattages. All in all, the Eleaf Ello Duro is a nice tank to have in your arsenal. Is it my favorite atomizer of all time? No, but I’m not really a big fan of tanks, and for a bundle atomizer, it’s actually better than I expected. Plus, it offers vapers a chance to try mesh coils, which I for one had not had the chance to do before reviewing the Duro. As a kit, the Eleax Lexicon is great value for money. You get an advanced mod packed full of useful features as well as a great sub-ohm tank, for around $70, which is not bad at all. Taken separately, the Lexicon mod looks impressive, with its flawless paint job and pulsating LED lights, but it does have some issues (at least my unit does). The fire button sometimes doesn’t work properly, and the power ramp-up takes longer than I expected. Still, it’s a solid device, one that I’m glad to add to my collection. As I said, the Ello tank is an above average tank which not only works great and is convenient to use, but also introduces mesh coils. Nice packaging, it comes in a box with some Coilart branding on it and a cardboard sleeve. Remove the sleeve and open the box to reveal your mod and your RDA. 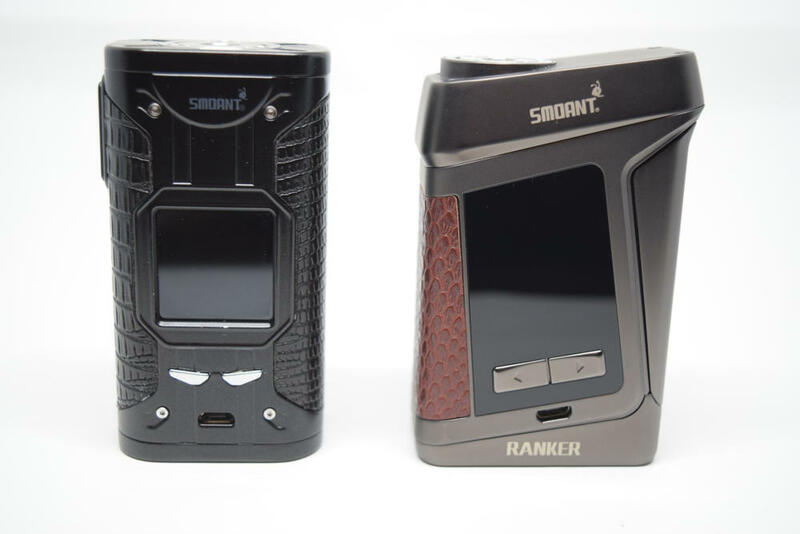 On the left side of the box is where you will find your mod and on the right side is where you will find the RDA. One thing that I’m impressed about so far, is they included some really nice Ni80 Clapton coils and some cotton in the packaging. First impression is, this is a good-looking, stealthy, little, dual battery kit. It looks like it goes well together and it feels good in the hand. It looks very simple as well. I’m going to mount some coils in the RDA, load up some batteries, and see how this thing actually performs. This is an unregulated protected device. That means the more you vape on it, the less power it is going to have. It does have some protections built into it like a low voltage protection, so once the voltage gets to low, it will not fire. Thats a nice feature because it ensures it will not put too much strain on your batteries. 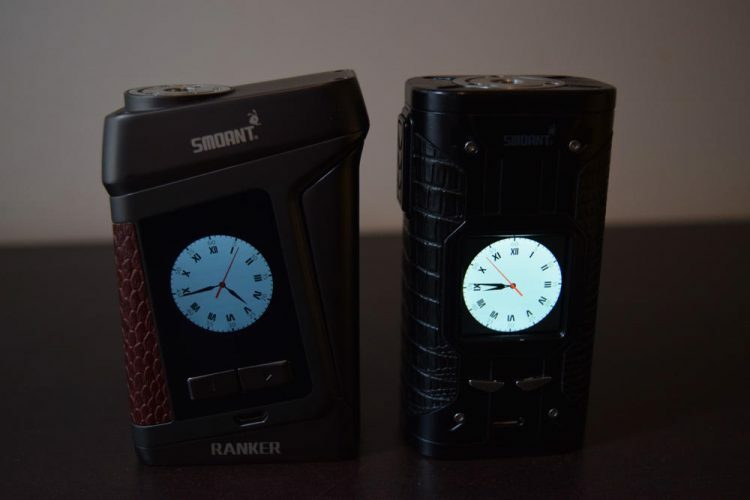 Coilart has been marketing it as a semi regulated mod. Nevertheless, this mod is still for experienced builders only. You must have a working knowledge of Ohm’s Law before you purchase this kit. I would also recommend that you keep your builds around .2 ohms. 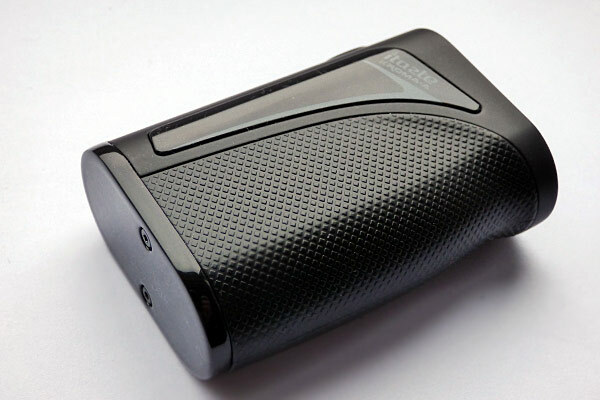 The Dpro mod is a very simple device and there really isn’t a lot to it. There is a screen on top of the device that has four blue dots. Each dot represents 25% of battery life. Obviously, if you have four dots that are lit up, that means that you are at 100%. If you have three dots lit up, that means that you are at 75%, and so on and so forth. The fire button is located right below the screen and it is rectangular in shape. It is raised off the surface of the mod and it does have a bit of a rattle to it. I would have definitely liked to have seen a tighter fire button. It also has a tinny type of feel to it and I just think Coilart could have done a much better job on the button. There is some Coilart branding on the button. On the top plate of the mod right across from the screen is where you will find the 510 connection for this mod. 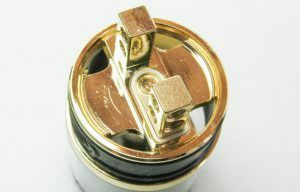 The 510 connection is gold plated and spring-loaded. It has a stainless steel circular shaped plate going around it. The 510 pin has a nice firm spring to it, with a pretty decent throw. Threading around the 510 is very smooth but some of my atomizers do gap on this mod, including the included Dpro RDA. I’m pretty sure that’s why they included an Ultem disc, in order to fill in that gap. You can run the disc with other atomizers if you want to and it will probably take care of the gapping issue. The Ultem disc also helps dissipate heat. 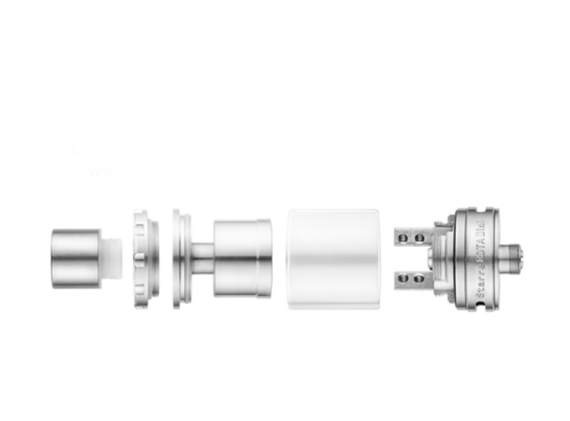 The Mod will hold 24 mm atomizers with no overhang. The plate of the mod is held in place by 4-star screws. The rest of the mod is just a rectangular shaped mod with curved edges to it. There is some subtle Coilart branding on one side of the mod but the overall construction of it is very nice. The mod is made out of mostly aluminum with an anodized paint job. It does feel really nice in the hand and the paint has held up quite well. On the bottom of the mod, there is some Coilart and Dpro branding on the battery door. Surprisingly, there really is no visible venting on this mod. I would have definitely liked to have seen some sort of venting, especially for an unregulated device. Open the battery door by pushing down and pulling out. Once the battery door is open, you will see two gold-plated, button-style battery contacts. The battery contacts are clearly labeled for the negative posts of your batteries. This mod does run your batteries in parallel. Batteries are to be installed positive side first. It also has reverse polarity protection just in case you make a mistake. Inside the battery tubes, you will find two, gold-plated, spring loaded, contacts. The sides of the tubes are made out of plastic, just in case one of your battery wraps has a tear. 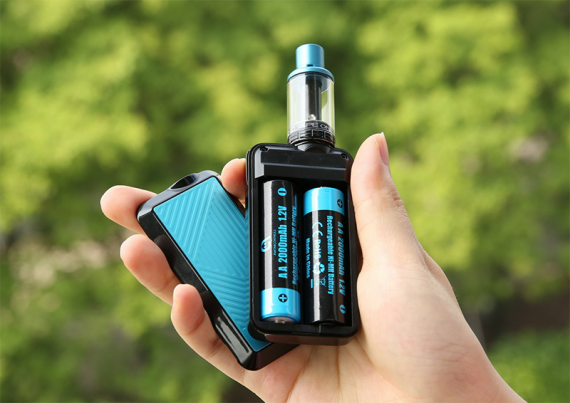 While this mod does take dual 18650 batteries, if you want to you can run it with just one battery, you can. It’s a nice little feature but I really don’t see why you would only put one battery in it, when you have the choice of actually using two. I have seen some sites list a USB charge port on the listing for this kit. The kit that I have does not have a USB charge port. If it’s there, I can’t find it. The mod does measure in at a stealthy 84.5mm by 44mm by 28mm. The Dpro RDA comes with a very thick Goon style drip tip. 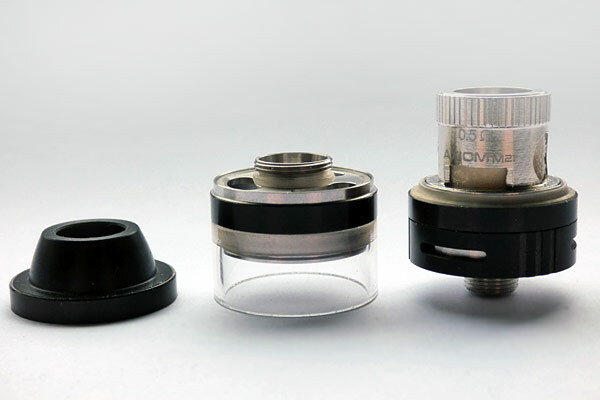 The inner diameter is nowhere near as wide as the outer diameter of the drip tip. It is a comfortable drip tip and I’m sure, having a smaller inner diameter definitely increases the flavor a bit. It is not the short chuff style DT that a lot of today’s RDA’s come with. This one has some length to it and I have to say that I really have been enjoying it. 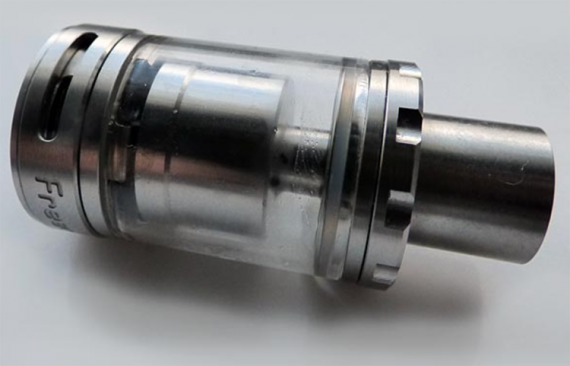 One con, there is no 510 drip tip adapter in the kit. I’m sure you could use some other 510 drip tip adapters, but I would have liked to have seen one included in this kit. There is also only one drip tip included in the kit as well. That’s just not going to cut it in today’s market. Every other company includes multiple drip tips. I don’t see why Coilart couldn’t do that. The 510 opening on the combination top cap barrel has a nice thick o’ring on the interior. The stock drip tip fits nice and snug and so will all of your other aftermarket Goon style drip tips. The barrel and top cap are all one piece and there is some Coilart branding on one side of the barrel but it is black on black and very subtle. The interior of the top cap does have a slight conical design towards the top of it. There are two airflow holes located on each side of the barrel. 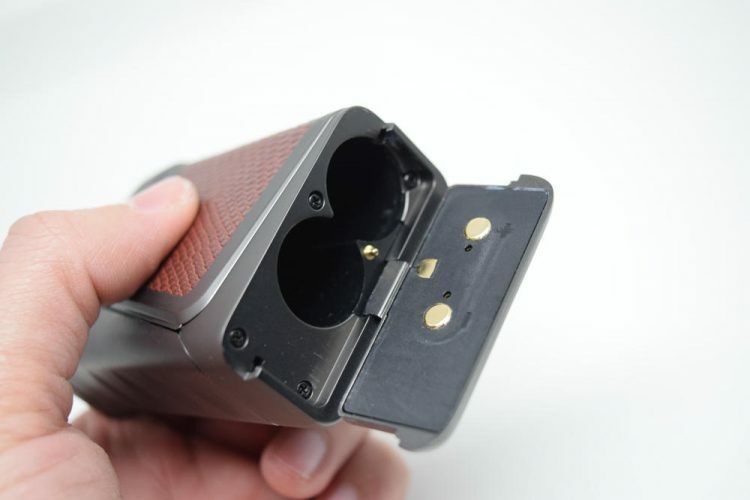 Each air flow hole measures to 4.5 mm and it coincides with the two airflow holes on the deck. The airflow holes are oval in shape and fully adjustable. The base of the RDA has two o’rings that do an Ok job of keeping the barrel in place. In between the two o’rings is where you will have access to your deck screws. This is a postless deck and the deck screws are accessed from the side of the base. The deck screws are hex screws and of nice quality. On the bottom of the base, there is some Dpro branding as well as some Coilart branding. The 510 on the bottom of the base has a Phillips head slot on it but you can also get it out with a flathead screwdriver. There is an insulator ring around the 510. The whole base is gold plated including the threading. The threading around the 510 is very smooth but this atomizer does gap on this mod if you do not use the included Ultem disc. When I have used the Dpro on other mods without the disc, there has been no gapping. Another thing I have to give Coilart a lot of credit for is that they did include a squonking pin. The reason I give them a lot of credit for that is because this kit has no squonking capability, yet they did include the pin. That’s a plus in my book. I have used this particular RDA as a squonker and it does perform very well. One really annoying thing about this RDA is the fact that the o’rings could be a little tighter. The top cap seems to spin quite freely especially if you over tighten it on a mod a little bit. Yet, the top cap does not come off too easily. Sometimes, you actually have to take the barrel off of the RDA and twist just the deck section in order to get it off a mod. That’s an annoying feature and I really wish they would have tightened up the o’rings. The whole deck of the Dpro RDA is gold plated and postless. It’s got a decent juice well that measures in at 3 mm but I would have liked to have seen one just a little deeper. On the sides of the deck, it has two posts coming out, on the outer circumference that have an oval shaped air holes cut into them. This is the shape that lines up with the oval shaped air holes on your barrel. It looks like the airflow hole is drilled downward, so it hits your coil directly. So far, the airflow has been extremely smooth and I have to say that I have been enjoying this RDA. The postless deck is well done and it can accommodate some decent-sized coils. The post holes are not as big as I would have liked them to be and running some big flat wire builds can be a problem. The post holes measure 2.5 mm each. This deck is really set up for Clapton coils being the biggest types of coils you could probably run in it. That’s not due to the size of the deck but more because of the limitation of the post holes. One really nice feature about this RDA is the fact that Coilart precut the coils that they included in the package. They cut them the perfect length for this postless deck. 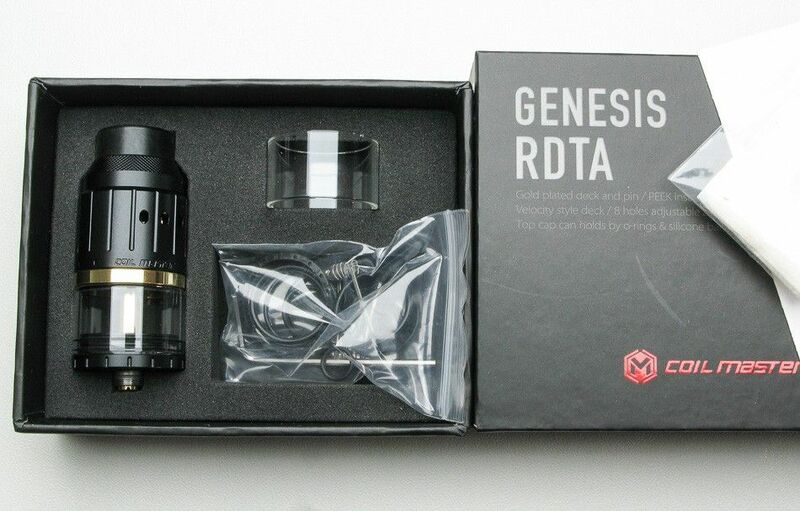 So, when you first get this RDA in this kit, you do not have to spend time figuring out what the proper length the leads should be for this deck. I’ll give you a pro tip, if you want to cut your leads to the perfect length every time, all you have to do is measure your leads up against your drip tip and cut them right where the Dpro branding ends on the drip tip. Do this, and every time, your leads will be the perfect length. Once your coils are mounted, if you are running contact coils, you can pulse them to get the hot spots out. After that procedure is done, wicking this is very simple because it’s a postless deck. Simply pull your wicking material through the coil and make sure that when you cut it your wicking material, it touches the bottom of the deck. Like I said before, I have had this RDA for quite some time and that has given me the opportunity to run a lot of different builds in it. While this is a dual coil RDA, I have found that it actually excels in single coil mode. I like running one big coil in the middle of the deck and I feel like this RDA vapes beautifully that way. Right now, I have dual stainless steel Clapton’s in there ohming out at .17 ohms. I have them on top of the Dpro mod that’s included in the kit and I get a really nice vape off of it. The clouds are really nice and the flavor for this RDA is just on point. The airflow is extremely smooth and when I cut it down about half way, you can definitely feel the flavor intensify. I have really been enjoying the smooth airflow that this RDA produces. I have to say, I really do enjoy the simple understated look of the Dpro Kit. It’s a small no nonsense kit that is very easy to carry and also extremely pocketable. I like the fact that this is a simple mod and there is no over complicated menu system. I click the fire button 5 times and I can put this whole kit in my pocket with no worries. I also like the fact that I get a mechanical mod type of experience but I also have some protections built in. The kit comes in a bunch of really nice colors and I have to say that aesthetically, it is very pleasing. It also has some pretty good build quality to it as well. The anodized finish has held up really well. The Dpro has a non-variable chipset in it that is capable of 133 watts. 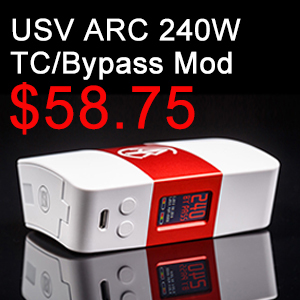 It has a maximum voltage output of 4.2 volts and it will fire down as low as .08 ohms. Honestly, I would not recommend firing this mod that low. It also has an on-off capability. I would classify this mod as unregulated with some protections. Click the fire button 5 times to turn the mod on or off. When I first got this kit, I was not sure how I would like it because it just looked way too simple. Sometimes though, the simple things in life are better. I have to admit, I have been enjoying using this kit for quite a few weeks now. It vapes really well and it fires instantly. I like the battery life that I have been getting when I use this mod. I also like the flavor and clouds that the RDA is capable of producing. I would have really liked to have seen Coilart include an ohm reader on the screen. It’s not a big deal, but before I put something on this mod, I have to first check it either on another mod or one of my ohm readers. I would have rather had a feature like that on the screen, so I can see what my RDA is doing. It would have also been very convenient. If you are going to build a mod like this, I really do believe you have to have some sort of battery venting. I was a little surprised that there is no battery venting present and I definitely would have liked to have seen some. I like this kit a lot more than I thought I would when I first received it. It actually vapes really well and the RDA included is a good one. It’s a nice stealthy kit that seems to be well built. It does have a lot of nagging little issues that probably could have been addressed if Coilart was paying more attention. You’re probably going to see a decent amount of cons in the cons section and that’s unfortunate. The cons aren’t really deal-breakers but they have to be listed because there are quite a few little, nagging things wrong with this kit. The shame of it is, those little things, really don’t affect the overall enjoyment of the kit but they should have been corrected before this mod was brought to market. Fortunately, the overall vape quality outweighs all those nagging little cons, Overall, I really do like the kit, I just wish Coilart would have taken more care, before they released it. 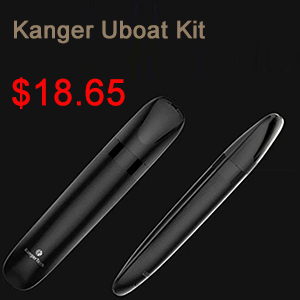 If you are looking for that mechanical mod type of experience with some protections, this kit is really tough to beat. The Innokin iTaste Kroma-A Kit offers a 75W TC capable device and also includes the Axiom M21 Sub-Ohm Tank. It is extremely compact just like the original Kroma which I reviewed. Featuring Innokin’s reliable and accurate Aethon chipset the Kroma-A is supports all major wire types. So let’s take a good look and see what it has to offer! TC Mode: with Ni, Ti, SS316L. 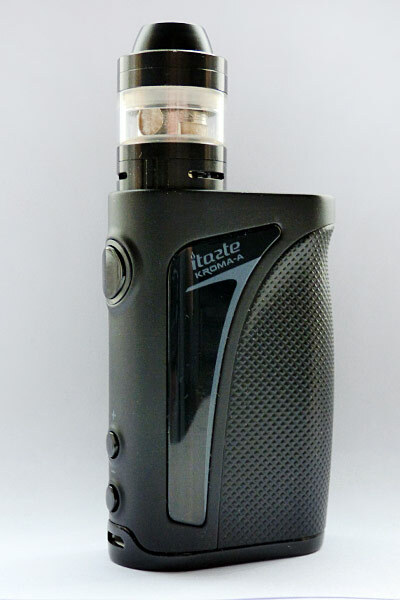 1 x iTaste Kroma-A 75W TC Mod. 1 x Innokin Axiom M21 Tank. 1 x 0.8 Ohm Kanthal BVC (pre-installed). 1 x 0.5 Ohm SS316L Coil (Spare). The packaging is really well done and the box opens into two compartments, one holding the mod and tank, with the other including all the accessories. 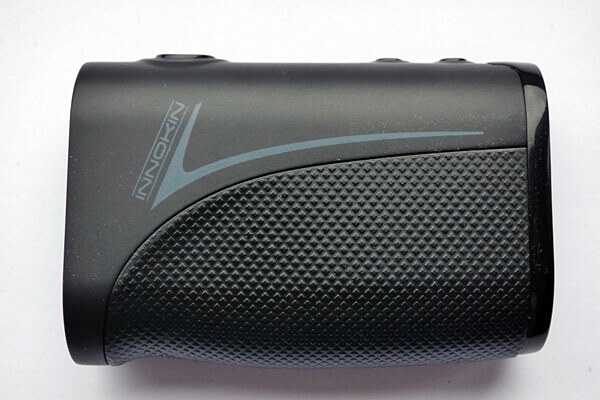 The overall design of the Kroma-A is highly compact and very much like the original Kroma device I covered. One major difference is that the tank now sits on top of the device itself and is no longer housed in a recess and loses the old 510 connector adapter. This means that the Kroma-A is now far more compatible with other atomizers you might want to use from your collection. Anything up to 24mm diameter will tend to look good but be aware that 25mm will result in some slight overhang. Another difference is that the paint scheme is done in one primary colour (red, blue and black) and features black inlays. While it does look good I actually prefer the original Kroma’s look because the white, black and red scheme seemed far more modern and striking, but personal taste varies greatly amongst users. What is nice is the lovely textured grip which means you the device is highly unlikely to ever slip out of you hand. Ergonomically the Kroma-A feels extremely comfortable, lightweight but also quite robust and well balanced. The 510 connector is made from Stainless Steel so it should last a good amount of time. The 510 pin is springy, has a nice amount of travel to it, feels well fitted and the various atomizers I tried from my collection all fitted flush. Just like the original Kroma the display features a dark screen protector, which unfortunately dims the information to such a degree that it can be tricky to read in bright light. All of the typical things you’d expect to see are shown including Resistance, Wattage, Temperature; as well as Voltage and the current battery life. There are three buttons on the device and all of them are well fitted and thankfully rattle free. In addition they are all highly responsive and have a good feel to them. 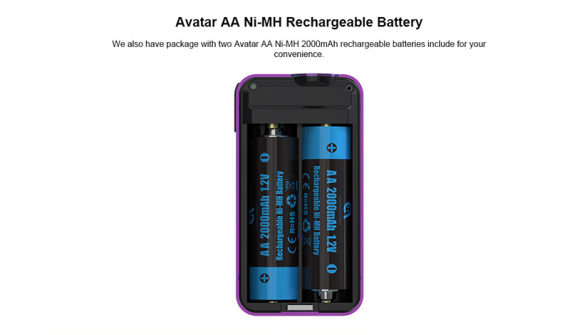 The device comes fully charged up and is fitted with a 2000mAh capacity internal battery. This should last you a fairly good amount of vape time between charges. 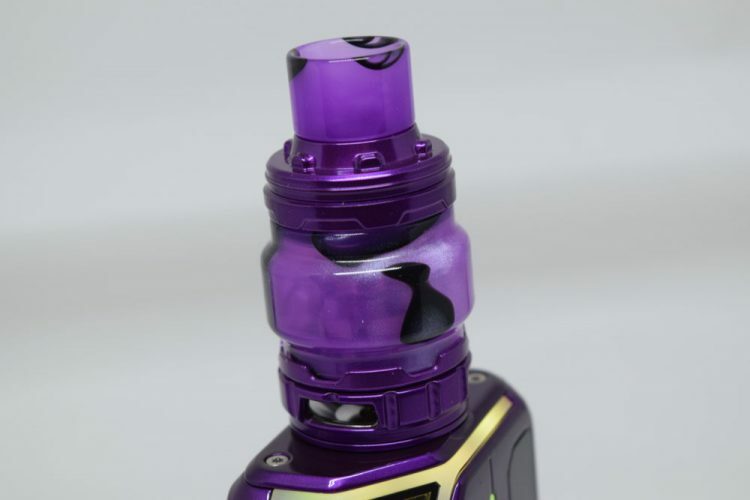 Like other Innokin devices the main fire button has an LED positioned behind it which changes colour according to the current charge of the battery. It starts at green, changes to orange and when it glows red it’s time to recharge. 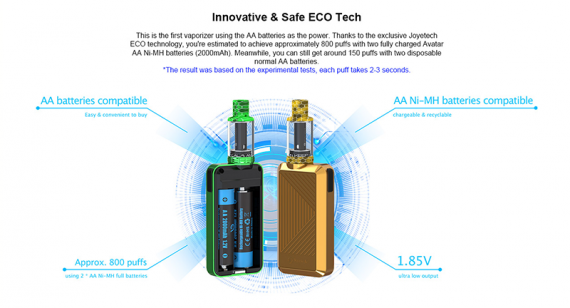 There is no venting on the device, but since it only goes up to 75W maximum output and is loaded with safety features it isn’t really a concern. The Micro USB port is fitted horizontally nicely below the minus adjustment button, which means you can stand the device upright while charging. Included in the box is the Axiom M21 Tank which is pre-fitted with a 0.8ohm Kanthal coil. In addition the spare Stainless Steel 316 coil can be used in Variable Wattage or Temperature Control Mode. 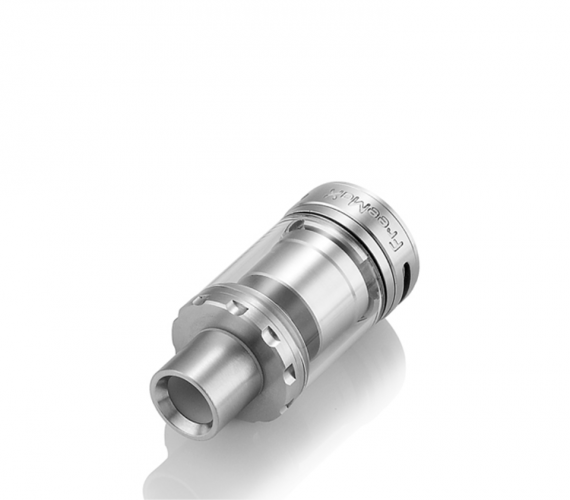 The tank is extremely compact has fully adjustable airflow and a top filling design. It features two thick O-rings to keep the glass in place. The Delrin drip tip/top cap is tapered and feels comfortable on the lips, but if you don’t want to use it a 510 drip tip adapter is included in the box, as is spare glass for the tank. If you don’t live in the EU or if you decide to order from elsewhere, keep in mind the kit includes the Crios Tank instead of the Axiom. 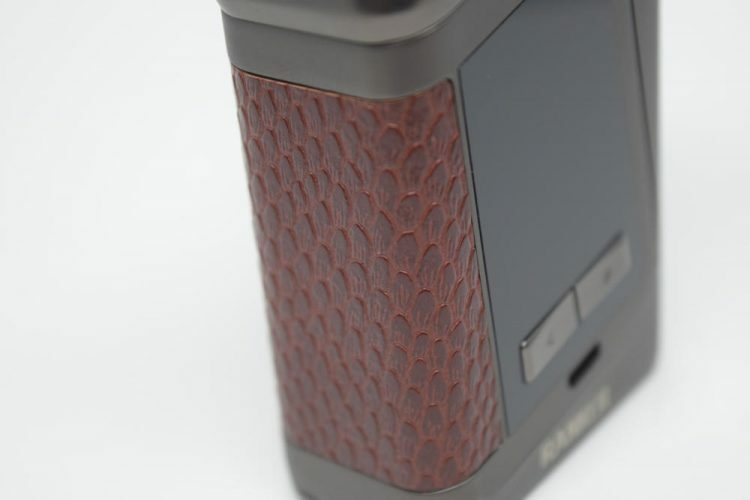 The Kroma-A works just like most Innokin devices. The manual is very well set out and everything is explained in an easy to understand way. Three clicks switches the device on/off. The LED positioned behind the fire button lights up and also alerts you to the current level of the battery. To change the Wattage or Temperature hold down the plus button for 2 seconds until the display flashes, then adjust the setting with the plus or minus buttons. As far as the Axiom Tank goes I didn’t really enjoy priming the coil, or even filling the tank. While it is nice that the whole device and tank are highly compact, the atomizer itself is incredibly small and feels really fiddly if you have average sized fingers. You also need to make sure it’s fully tightened up too or you will get juice leaking down the side of the mod. 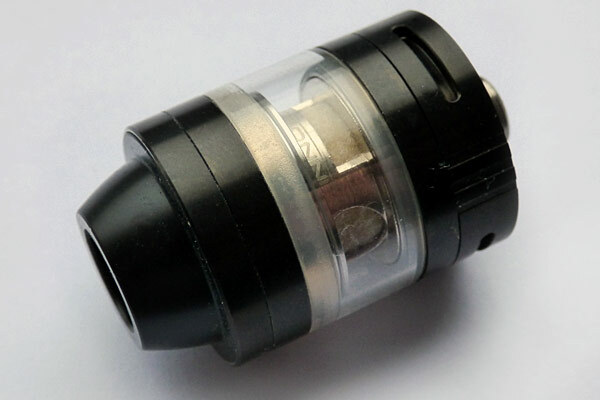 The filling ports aren’t particular large and another inconvenience is that it is really difficult to adjust the airflow when the tank is fitted to the device. Given that the tank features two very thick O-rings it can be difficult to gauge the fill level and on occasions it’s very easy to overdo it. These are of course things you will get used to with frequent use but it does feel a little less user friendly as a result. 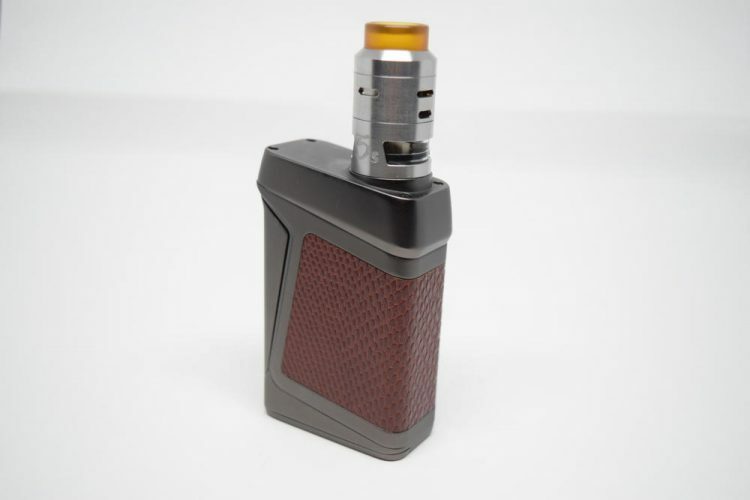 The Kroma-A is fitted with the very accurate and superb Aethon chipset so you are unlikely to encounter any problems with Variable Wattage or Temperature Control Modes. Now while the Axiom Tank is a bit fiddly, the flavour I got from the pre-fitted 0.8ohm Kanthal coil was excellent. I had filled the tank with some Manabush Omusa and while vaping I could easily pick out the deliciously rich notes in the juice. Vapour production was also incredibly good for such a tiny little tank and even when using 50PG/50VG Manabush I got a decent amount of vapour. 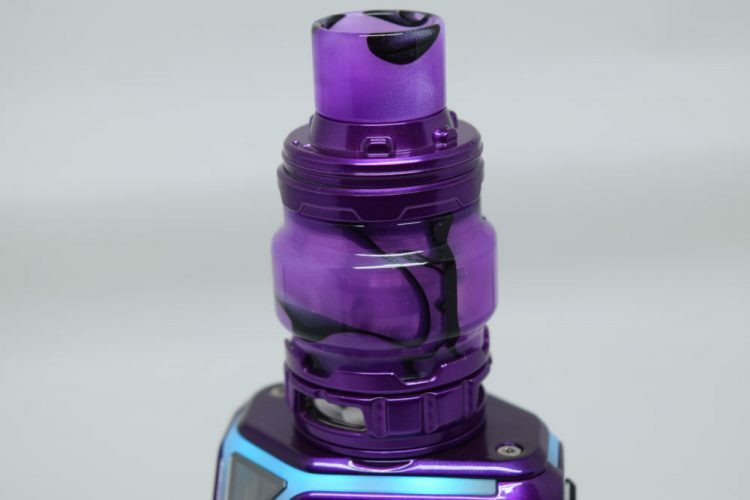 The major downside is that the tank is 2ml capacity and vaping at a modest 30 Watts it does drain very quickly, of course this is not really a surprise considering the size of the wicking slots on the coils. To an extent I wish Innokin had gone for smaller less juice guzzling coils. Nevertheless the tank can be quickly refilled. In terms of the draw it is suited to a slightly restricted direct lung inhale and this can be closed down for an even more restrictive vape. To a degree it might even be suitable as a loose mouth to lung vape, but your particular mileage in that department may vary. Switching the Kanthal coil out for the included Stainless Steel one the Kroma-A offered an excellent vape in Temperature Control. There was absolutely no heat spiking or Resistance fluctuations. Flavour wise it was certainly somewhat crisper than the Kanthal one and puts out more vapour, but being lower Resistance drains the juice much faster. Battery life on the whole is typical of a 2000mAh device. 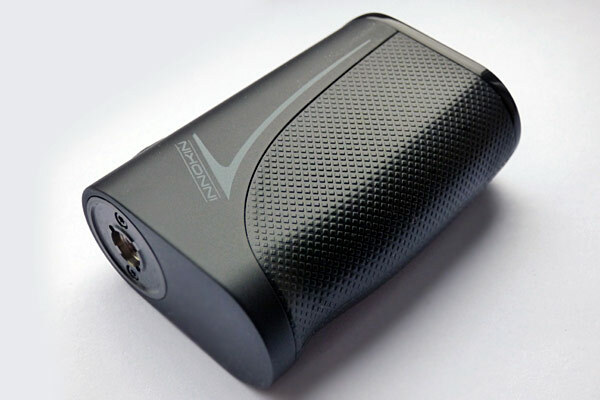 An average vaper should get a full day’s of modest use out of it before having to recharge. The device does feature 2A charging and takes about 2.5-3.0 hours. The Kroma-A is a great little device, ideal for a newcomer, or just for an existing vaper who prefers something more stealthy and lightweight. 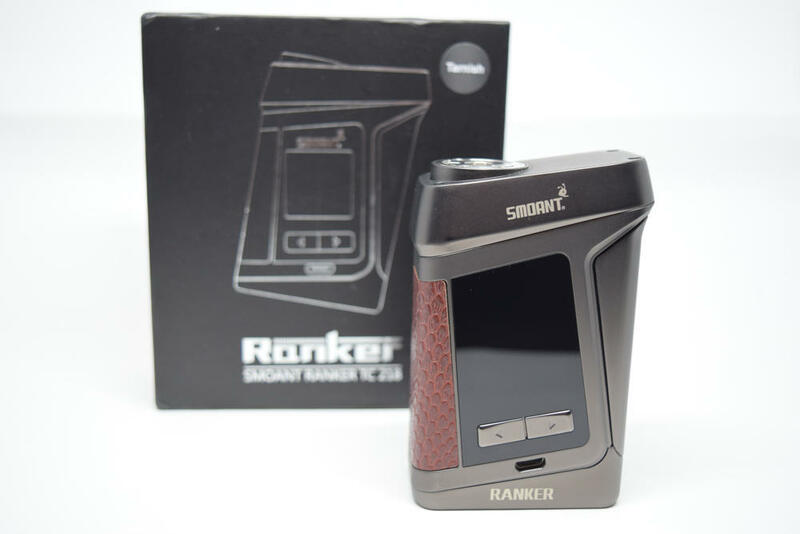 It performs extremely well and is definitely up to Innokin’s typical high standards of production! There are a couple of minor issues such as the dark screen protector. The Axiom M21 Tank can feel somewhat fiddly to work with and is also a bit too juice hungry. Yet despite that it does offer a truly lovely vape and as a whole this is really attractive kit! What is also good value to the potential customer is that it comes with two coils allowing a new user to try out both Variable Wattage and Temperature Control. 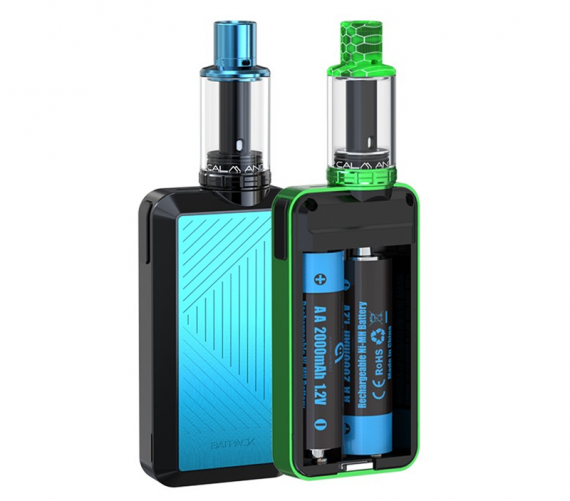 If you’re looking for a compact little set up or if you are thinking of making the switch to vaping this kit is certainly well worth checking out! A Long Awaited Update. But Is The Aspire Nautilus X Worth The Wait? The Aspire Nautilus X review we will get to in a moment. But first.. How long have we had to wait for the Nautilus tank update?! Hopefully, it will all be worth while! Recently we have also seen the addition of the Aspire Triton Mini which also offers a great MTL vaping experience. Can the new Nautilus X tank live up to it’s name? Let find out. 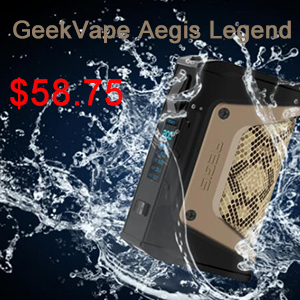 The Aspire Nautilus X is completely different, in all ways, from the original Nautilus tanks. 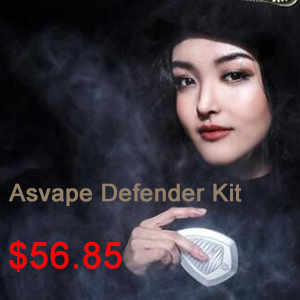 Not surprising seeing as vaping has come along way since Aspire first released the original tanks. They have done a great job as well. The Nautilus X is great looking tank. It’s kind of a squashed version of the Aspire Cleito minus a few obvious points. As would be expected, it can be broken down for easy cleaning. 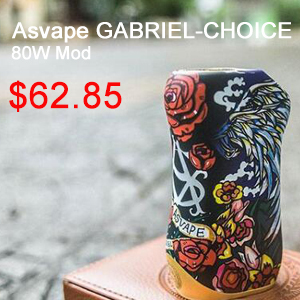 Aspire have also introduced top fill, that is fast becoming standard with tanks. Simply unscew the top cap fill on screw back on. The tank has been made to be TPD compliant, so 2ml is the max at the moment. Whether an extra Pyrex extension will be released to offer increased capacity remains to be seen. With this being a fairly small tank it does look great on the mods I tried. Especially the Artery Nugget. Which is actually a great little partner for the Nautilus X if you are looking for a stealth vape setup. Here it is on the Innokin Cool Fire 4 TC 18650 Mod. Aspire have introduced a new coil technology with the X called the U Tech Coil. Instead of the standard coils that pair with a chimney in the tank. The U Tech coil acts as the chimney as well as helping with the airflow. One of the first things I noticed with the tank is the lack of airflow holes. There are 2 very small holes at the base of the drip tip. These are adjustable by rotating the top plate on the tank. This is where the U-Tech coil comes in. The new coil design, in a U shaped chamber, allows for air to flow through the top airflow and around the coil twice before taking a drag. In short, there are pretty much no similarities to the original tanks in terms of build and deign. How Does The Aspire Nautilus X Perform? The Nautilus X comes with 2 x 1.5 Ohm U-Tech coils, one already pre-installed. As mentioned before, the coil acts as the chimney. Once the coil is in place the seal in the base of the tank is very much air tight. Most tanks have airflow holes on the base, which can on occasion be one of the main causes for leaks. The Nautilus X has none. Aspire have done this to cut down on the chances of e liquid leaking. Again, likely in light of the TPD regulations. I have to say it works a treat. I have not had so much as a drop of juice leaking from the tank. The new coils do a great job of creating the additional airflow needed for a satisfying vape. This is a mouth to lung tank so it goes without saying the clouds aren’t going to be competition winners. Vaping at 20W, the clouds it does provide are very respectable. The coils are rated at 14W-20W, I did manage to go a few watts beyond this but 20W was my preferred setting. The flavor I found was very good as well. I vaped a 60/40 VG/PG juice and it wicked well with no dry hits. Best way to get to your preferred vape is to start low around 14W and work your way up one watt at a time. Of course, this is after the coil has been primed. Or in other words, after you fill the tank let it sit for 5 minutes to allow for the wick in the coil to soak up the e juice. If you are a new vaper, this is a very important point. If you don’t do this and fire up your device you will burn your cotton and the coil will need to be replaced. Changing the airflow makes a difference to the draw, this is down to personal preference but I went for the airflow half shut. Changing the airflow makes a slight difference to the draw, this is down to personal preference but I went for the airflow half shut. It just gives a slightly tighter or looser draw. Not by much but it’s something you will want to have a play around with. While the Aspire Nautilus X is only a Nautilus by name, it is a great addition to the mouth to lung tank line up. Along with the Triton Mini and the three Nautilus tanks, Aspire have a selection of the best MTL vape offerings on the market. It goes without saying, the X should be considered if looking for this category of tank. Coil Master is known for its accessories, the brand launches into rebuildable atomizers with the Genesis RDTA , without much surprise and a little disappointing on the rendering of flavors. The Genesis RDTA comes in a box with a spare pyrex and a coin pocket including seals, tray screws, resistor and hex key. The realization of the atomizer is correct, without major defect but without returning the spirits so far. In use it is no problem, but it does not feel like a quality beyond the average. It will be marketed from August 21 and the price announced on the site of Coil Master is $ 29.99, which is consistent with the product. For this first RDTA, Coil Master probably preferred to ensure a flawless product rather than innovate. The brand is widely known, no need to take too much risk on a first atomizer. And in fact the Genesis takes the recipes that have been proven lately. 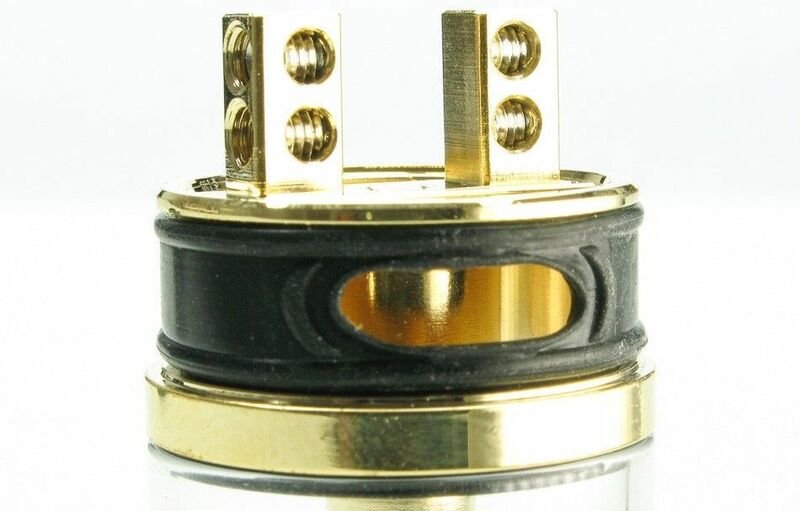 We will start from the bottom and the 510 connection whose positive pinis more than 1mm from the thread, which is perfect if you want to mount the atomizer on a hybrid connection, you can do it safely. The threading is relatively short and does not pose any problems with any box. The liquid filling is done by a large opening closed by the top cap . An interesting point, the very wide joint that covers all this part of the atomizer. The imperviousness is irreproachable, but it will be necessary to take care of this piece not easy to replace if it deteriorates. There is a spare in the spares, but all the same. The airflow is very airy, almost free if it is opened completely. It can of course be adjusted by turning the upper part, to leave it open only three, two or one of the four cyclops. With only one open, there is a relatively restrictive airflow, which will be perfect for a vape at around 40 watts. The arrangement of the openings of air favors the rendering of the flavors with the reasonable powers, when one leaves one or two opening. From three, we have a very wide air flow, and it will take a very long resistance to be in front of the holes. And with everything open, there will inevitably be openings that will not be beyond resistance, and the rendering of flavors is clearly felt. 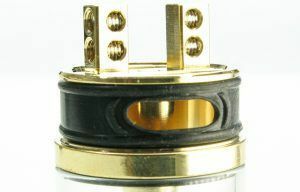 This questionable air flow in the aerial position corresponds to the drip tip , which is 12mm wide. A very large format that quickly makes you regret a 510 adapter. No way to put the drip tip of your choice, while a less open model would undoubtedly improved the rendering of flavors with an intermediate adjustment of the airflow. Another regret, the impossibility of mounting the Genesis in single coil. It will be necessary to make double coils, which will however be facilitated by the Velocity style tray . Nothing complicated for editing, this type of tray is one of the most functional. The ideal resistances are 3 mm in diameter in my opinion, it corresponds best to the passage of cotton wicks in the tray. Be careful not to over-tighten the cotton so that the air can easily enter the tank when it is going to empty, there is no small hole provided for the base of the tray. Still, it will be difficult to find an ideal assembly with this atomizer. The best compromise seems to be a double coil to be vapered at 60 or 70 W, with two open air openings on all four. The rendering is then correct, say consistent with other similar RDTA, but we really regret not being able to optimize it with a finer drip tip. A rendering of flavors that will ultimately be correct in the best case. Our rating: 3/5 . For its first RDTA, Coil Master offers a simple model, which takes the current standards without great innovation. A choice that can be understood given the brand’s reputation. Still, the airflow leaves little room to optimize the rendering of flavors, which will be at best correct. An atomizer a little disappointing that I do not recommend, not that it is bad, but because there is better whatever the style of vape you are looking for. 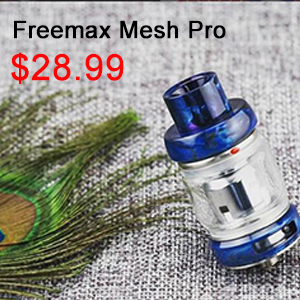 It is under this motto that you could read in the headline of the review that a new atomizer from the FreeMax company was born, which became a little smaller, but a little better and a bit more modern than the usual mode. 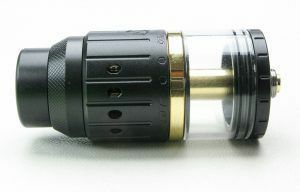 I am sure that most of you are already very familiar with the Starre model and those who used this model did not really like the removable evaporators, and the manufacturer apparently listened to the vapers and introduced a new atomizer with a serviced platform with velocity format adjustable air flow and ease of use. 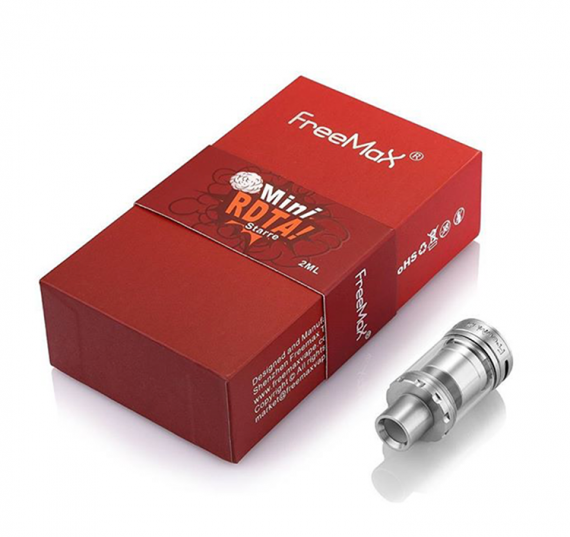 Unlike the first model, the FreeMax Starre Mini RDTAIt is a compact device with a capacity of 2 ml. The capacity of the tank is probably the most controversial point, since today such a supply of liquid on modern and powerful devices will be enough for just a few puffs, but the manufacturer did so and there’s nothing to be done about it. Appearance at the same time simple and at the same time strict, nothing superfluous to distract from the process of soaring. Pin connector is very easy to adjust, this is also a small problem, as it can simply loosen and lose contact. The upper refueling occurs within a few seconds and this probably crosses out the lack of tank capacity. Each part of the atomizer perfectly fits with each other, everything sits firmly and securely, a tank of borosilicate glass of good thickness, complete with a spare tank. Drip type though stainless steel but with a delrin insert that minimizes the amount of heat that reaches your lips, it can be replaced with any similar drip type from your collection. 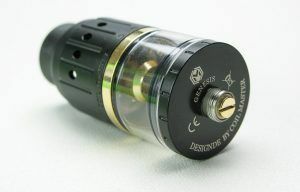 Atomizer has two fully adjustable airflow holes “Cyclops format”. The adjustable ring works well, the stroke is not too loose and not too tight, which allows fine adjustment of the air supply to the chamber being serviced. If you have already dealt with the “Velocity” serviced site, then you will surely have no difficulty in servicing and this atomizer is very simple, reliable and productive. The ability to install two spirals allows you to get maximum satisfaction in the process of soaring. Screws with excellent thread, wide holes, the only problem you may encounter in the process of servicing the atomizer is the limited amount of clearance for installing the spirals, although servicing the atomizer several times can be used to this. As a conclusion. 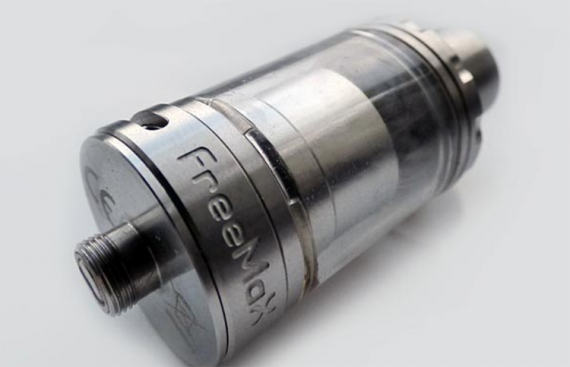 In terms of processing, ease of use, performance and price, the Freemax Starre Mini RDTAis a useful device that simply must be in the collection of each vaper. Among the shortcomings, we single out only the capacity (2 ml) and the weak thread of the pin connector, while all other parameters remain at a height. All thick and tasty!